Multicomponent: Label component – How can we help you today? 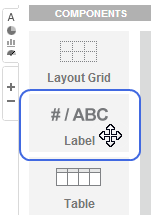 The Label component is a simple, flexible component, for displaying typed in or data driven text, numbers, and mini-charts. It is a great component for creating section headers and adding descriptions to your Klips. Format the content in the Label component as text, number, currency, percent, mini charts and more. Set horizontal alignment of the content in the component. Set a different font size, style, and color.